Won’t you be our neighbor?! Teachers, join us for this three part series where we explore Social Emotional Learning “Core Competencies” (CASEL@2017). With the help from Arthur, Peg+Cat and Daniel Tiger we will dive into how to weave SEL into your everyday lessons. Register for the three part “Live Learning” experience: Cultivating Good Neighbor Skills in the Classroom. has an original point of view. And I say HEY! What a wonderful kind of day! Teachers, join us for a one hour professional “live learning” event to learn about fundamental social emotional learning competencies for your students. 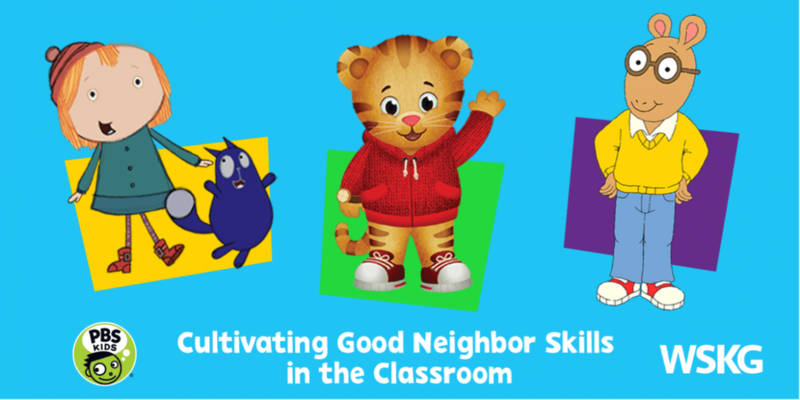 In the second part of our series, “Cultivating Good neighbor Skills in the Classroom,” participants will explore how the core SEL competencies of social awareness and responsible decision making are important to help children understand their place in the world, and how their actions impact others. With the help of our friends Peg+Cat, we will explore how to use these resources to develop empathy, appreciation for diversity, decision making and problem solving skills. PBS Digital Innovator All Stars will highlight exciting resources and models that you can immediately implement in your PreK-5 classroom. It’s Daniel Tiger’s Neighborhood! Teachers, join us for a Grr-ific one hour professional “live learning” event to help students build relationships. Explore how cultivating healthy relationships and interpersonal skills provide a foundation across all SEL competencies. This is the last episode out of the three part series that you don’t want to miss! PBS Digital Innovator All Stars, Julie Hildebrand and Michelle Garmon will highlight exciting resources and models that you can immediately implement in your PreK-5 classroom.